It's rare here on ConfettiLetters that you'll see me post an outfit of the day (OOTD). I think the last one I tried to do was back in 2011. But, as it's on this year's bucket list, I thought I'd pull myself out of my fashion rut and mix it up a bit by posting today's outfit. I apologise in advance for the awkwardness of the above photo, and the fact that it's been taken in my bathroom - stupid splodgey mirror...Damn I need to get better at this! I'm not the smallest girl by any stretch of the imagination, but one style of dressing I've found that actually works for me is this one, the high waisted skirt with a top tucked in. I've gone a bit skirt crazy lately and this is the latest one I've bought, it's a soft denim mix from New Look and cost around £15, which is a bit of a bargain in my opinion! I've teamed it with a casual, but pretty, white floaty top from Topshop, I adore the lace detailing all around the collar. I got this a while back, but it might still be in store, I believe it was £16. Other bits and pieces I'm wearing include my standard uniform of black leggings, usually £3 from Primark, and my long sleeved thin black cardigan (£8 from New Look). Until I actually put my bum in gear and really concentrate on slimming world I'll be forever living in my leggings...pretty clothes I am not worthy...Oh, and my necklace? I have no idea, I found it! This denim skirt is so cute! Love this outfit. I bought that skirt too, cheaper than the Top Shop one and just as nice :) Just waiting for the warmer weather to wear it! Lovely outfit! 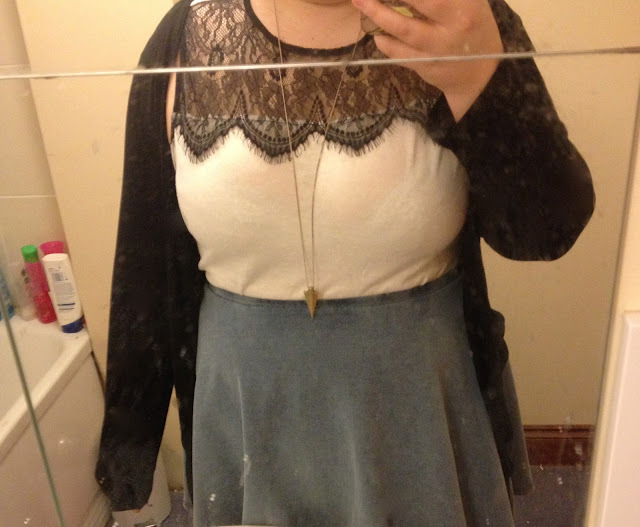 I have the Topshop version of that skirt in the darker denim but it's getting to big. I will be baring the New Look one in mind when I have to replace it! Thanks :D I wanted the Topshop one first but this one's much cheaper. I love that top! The detail is amazing! I adore how you paired it with a jean material skirt! That top is stunning and I think you look great :). I really love this outfit! The skirt is gorgeous! Love denim and lace, I need that skirt in my life! I've never been the biggest denim fan but I love this skirt!